too, and its not all bossa nova. Brazilian music seduces. The first taste came in the early 1940s, when Carmen Miranda took the world by storm, teaching it to samba. Twenty years later, jazz musicians got hooked on bossa nova. The musicians of today explore further, often working with Brazilian colleagues and sometime producing hybrid genres. 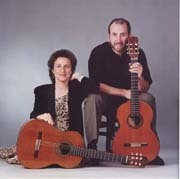 The guitar duo of Judy Handler & Mark Levesque included five Brazilian compositions in the handsomely produced CD Acoustic Blend, a collection of international tunes. Theyre not Brazil specialists, although Mark is deeply interested in Brazilian music. In this album the selections veer toward choro and bossa nova. From Waldir Azevedos repertoire they chose the somewhat atypical Spanish-tinged waltz Chiquita (albeit one of the composers hits), in which Mark plays bandolim and Judy guitar, with flute counterpoints by Anne Lemke, all at a leisurely pace, which prevails throughout the Brazilian section. 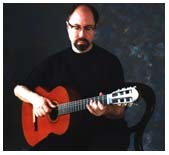 João Pernambucos classic Sons de Carrilhões is a challenge for any guitarist, having been interpreted by so many great musicians, including the composer. I would like to have heard more variety in tone and cadence here. In Tico-Tico no Fubá the two permit themselves some improvising and pick up the speed somewhat. Particularly tasty is Marks mandolin solo. Pé de Moleque, delivered in bossa-nova tempo, is enriched with bandolim (Mark plays both mandolin and bandolim on this album), flute, and discreet percussion. The final Brazilian cut is the most successful: Bonfás Samba de Orfeu, where the couple, with flute, bass, and drum accompaniment, takes off on a truly personal statement. Listen to audio samples from Acoustic Blend. (Independent JM 01; 2001) 51:37 min. English drummer/percussionist Chris Wells works primarily with Brazilian artists as both writer and producer. This year he released his debut album Pra Sempre, a culmination of his various collaborations. The disc, recorded last year in Rio, São Paulo, Memphis, and London, features performances by Ivan Lins, Coro do Batacotô, Mestres da Bateria da Mangueira, American keyboardist and Hammond B-3 crack Charlie Wood, Cassiano (from Mestre Ambrósio), drummer Téo Lima, and bassist Sizão Machado. Most of the singing is done by two of Chris co-authors, Valdo Silva and Mônica Vasconcelos. Although I was born in England, my musical roots are American, through jazz, soul, blues and gospel, and I felt it appropriate that the album reflect this in some way. Charlie Woods contribution was the vehicle for this. I wanted to introduce something different into the equation, so as not to stand accused of making yet another gringo latin jazz record. Similarly, I didnt want to pursue the route of mixing Brazilian music with drum n bass, as taken very successfully by labels such as Trama, principally because it doesnt reflect my musical background. So I decided to tap into R&B and blues, because they are the forms with which I have been most closely involved, other than MPB. The keyboard side of things took care of itself, in that I took the tracks recorded in Brazil to Memphis, for Charlie to record. Apart from mapping out my basic ideas to him, I specifically wanted Charlie to play in his way, rather than adapting his style too much. As far as I am concerned, swing is swing wherever you happen to be in the world, and I was very happy that the experiment proved successful. It was also interesting to see the reaction of the various musicians in Brazil, which was one of unanimous approval. As far as the drumming was concerned, aside from the tracks with Téo Lima, my aim was to combine my studies of Afro-Brazilian percussion with R&B, both conventional drums and loops, and use them alongside each other on certain songs. Another major influence was the way in which (for example) Marcos Suzano uses traditional percussion instruments, particularly pandeiro, in a different context from that in which they would usually be found, thus creating new timbres without resorting to electronics. Pra Sempre is a thoroughly enjoyable and well-designed production, both aurally and visually. (moo-phonix 120101; 2002) 58:29 min. Guitarist Joe Carter is a Brazilian jazz expert. Hes performed in Brazil since the 1980s, alongside some of the greatest names of the genre. Carter has released three elegant Brazilian discs in the past six years. The earliest, Um Abraço no Rio, is a quartet album recorded in Rio de Janeiro with harmonica virtuoso Maurício Einhorn, bassist Luís Alves, and drummer João Cortez. This was followed by The Samba Rio Trio, with New York-based bassist Nilson Matta and drummer Portinho. His most recent release is the duo album 2 for 2, with Nilson Matta. The harmonica is one of the two most distinctive accent instruments in Brazilian music (the other is the accordion), and Um Abraço no Rio wastes no time in introducing it at the beginning of the opening track, Tom Jobims Wave, which sets the tone for this beautifully contemplative album. Listening to the CDs in chronological succession, one can observe the music becoming sparser as the number of instruments diminishes. In 2 for 2, the melodies often are pared down to distinctive strings of single notes, with no loss of sophistication (indeed, the opposite is true). The original tunes in the latest disc include Carters Papas Baião and Olinda and Mattas Nascente. Particularly striking is the interaction between Carter and Matta as they pass the melody back and forth between guitar and bass. They do this brilliantly in Influência do Jazz, and then Joe takes off on a flight of fancy that culminates with tune quotations galore. Considering how Carlos Lyras song was a lament against the influence of foreign music on MPB, making real jazz out of Influência do Jazz is the final riposte in the debate. Another favorite track is Berimbauoften performed in a somewhat frantic mode but here done in the meditative style of Badens later years. Listen to audio samples from Joe Carters discs. (Empathy Records E1011; 2001) 54:13 min. (Empathy Records E1009; 1996) 53:09 min. (Empathy Records E1008; 1996) 54:05 min.